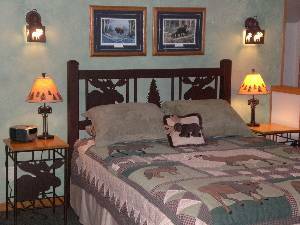 Welcome to Moose Alley Lodging! 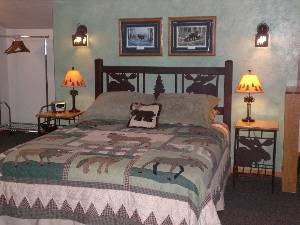 Our studio, guest apartment is located in a safe, quiet residental area within walking distance of downtown Cody, Wyoming - Buffalo Bill's little town in the Rockies! 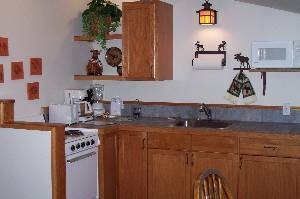 This beautiful vacation rental designed for two adults, is exceptionally clean, spacious, handsomely furnished in oak, wrought iron, and decorated in a moose theme. You'll enjoy superior quality linens and towels, a gas fireplace, and other amenities to make your stay as "close to home" as possible. This charming, guest apartment offers a private entrance with off-street parking, private bath with large vanity, fully-equipped, dine-in kitchen with refrigerator, range, microwave, coffee maker, toaster, blender, cookware, crock pot, dishes, glassware, utensils, cutlery, etc. The comfortable living area with cable TV and DVD player is great for relaxing after a long day of sightseeing. Iron with ironing board, linens, towels, paper and cleaning products provided. Airport shuttle service available upon request. 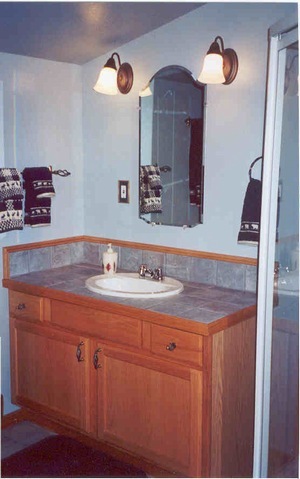 Private bath with large vanity and shower. Discounts given for off-season and extended stays. Housekeeping available at $20 per hour for extended stays. Deposit: 50% deposit required at time of reservation. Cancellations and Refunds: Cancellation 30 days prior to arrival will receive a full refund, 15-29 days - 50% refund, less than 15 days cancellation notice - no refund. Other Fees: 4% sales tax.